Cod is one of the most versatile fish, as it can be cooked in almost as many ways as one is able to imagine. Battered, cooked with onions, a la Riojana (Rioja), a la Vizcaina (Biscayan), Galician style, grilled etc… Its low calorie intake and excellent nutritional properties make cod a very healthy option. Cod, as one knows, can be fresh or salted. 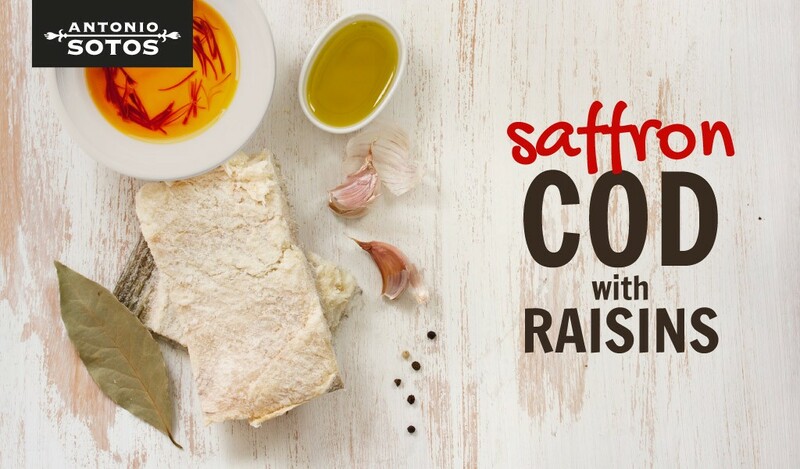 For this saffron cod with raisins recipe we’ll be using salted cod, therefore, the salt must be removed before cooking and eating it. In order to remove the salt, the cod must be placed into a bowl and covered with cold water and then left to soak for at least 48 hours before intending to cook the dish, and changing the water several times a day (generally every 8 hours). Chop the onion and garlic and lightly fry in the olive oil (EVOO). When the onion is transparent, add a teaspoon of flour and stir. Then add the saffron strands and raisins and blend. Add the white wine and allow the alcohol to evaporate. Set aside. Making the cod confit. To that end, add the olive oil into a saucepan or frying pan, add two tablespoons of water and leave to boil. Remove from heat and leave to stand. Thanks to having added water, it is known that water boils at 100ºC., therefore, bring the water to a boil at 65ºC (checking the temperature with a cooking thermometer) and then add the cod. Add the cod skin side up, ensuring that the loins are well covered or submerged and leave to cool slowly in the oil for approximately 30 minutes. After that time, the confit cooking process is completed. Remove and set aside in the refrigerator for approximately two hours so that when the cod has cooled down ooled it can be handled more easily. Cook the potatoes and peel. Slice the potatoes and set aside. Preheat the oven to 200ºC and after heating place the cod loins into the oven so as to heat the fish. Don’t spend too much time in heating the cod as one will run the risk of overcooking it!. To serve, place some potatoes onto the plate, much like a bed of potatoes, and then add the cod loins on top. Cover with the saffron and raisins sauce and garnish with chopped parsley.